We’ve identified the top five stress busting foods to keep your cortisol levels low. Remember: you are what you eat. Many plants are jam-packed with powerful antioxidants, and garlic is no exception. Garlic can protects us from a range of diseases and conditions, such as high blood pressure and heart disease. Stress weakens our immune system, so garlic helps us toughen back up. Garlic serves our bodies well, by reducing stress and fatigue and increasing energy levels. The great thing about garlic is that you can chuck it in nearly every meal! According to new research, the best soothing scent is your everyday orange! Brazilian scientists inhaled one of three substances, orange, tea tree and water. Those who smelt orange were less anxious throughout the test and the effects lasted longer too. Oranges are full of vitamin C and they can be consumed anywhere, with their tough skin remember to keep one in your handbag at all times! So I couldn’t go this whole list without mentioning the one food that is certain to boost my own mood. Chocolate; it has an undeniable link to mood, of course it has to be eaten in moderation but research shows chocolate does actually make you feel better. I’m not saying grab a double decker and be on your way, dark chocolate in particular is known to lower blood pressure, improve moods and is full of magnesium and iron. Make sure you get the good kind with a high cocoa content (70% or higher). 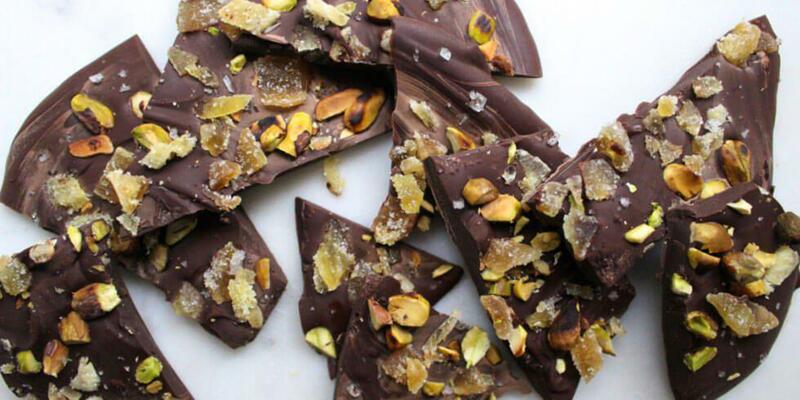 I love making a dark chocolate bark, top it with extra goodness and ta-daah - check out this recipe from Crunchy Radish.